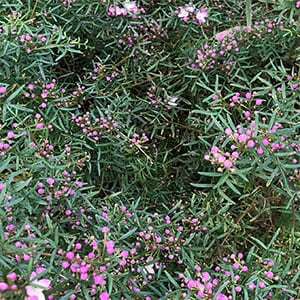 Low growing compact native plants are an asset to any garden, Boronia muelleri is one such plant. Attractive flowers and fragrant foliage add to the overall appeal. 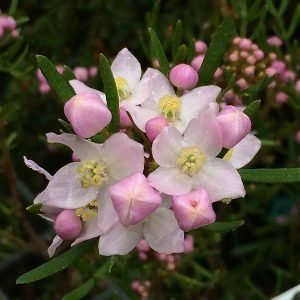 From Victoria through to New South Wales, Boronia muelleri is commonly called ‘The forest Boronia’. It is a variable species and although the main flowering period is fromAugust to November, the flowering can be a little sporadic. The variety most widely grown is ‘Sunset Seranade’, and this is a fairly low growing compact plant. Reaching only 1m in height in most conditions, and with a similar spread, it is an easy care plant. Soft pink flowers in spring to summer, and ferny foliage make this a most attractive plant. Boronia mulelleri as the common name suggests, grows best is dappled shade, they also like good drainage and low humidity. If you can provide these three factors you will find them to be an easy care plant. Mulching is not recommended as this can raise humidity and give rise to fungal problems, so use some rocks to protect the root system instead. This is a species that is suited to growing in containers. Tip pruning after flowering will help promote a tidy habit. Flowers – Starry Pink buds opening to a pink flushed with white. Foliage – Mid to deep green and aromatic when brushed against..
Fertiliser – Use a slow release, native plant fertiliser in spring.